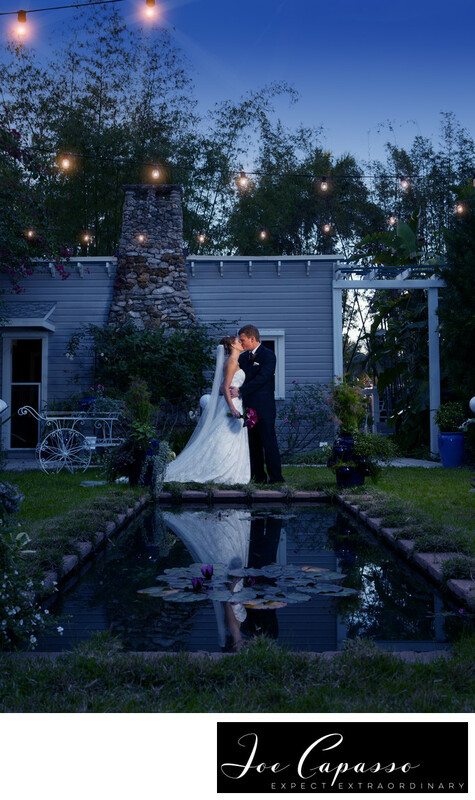 A couple married in the Moonlight garden at the Edison Ford Winter Estates in Fort Myers, Florida. It's one of the venue's popular locations to hold a wedding ceremony. The Edison & Ford Winter Estates is a historic museum. It is the former property of both Henry Ford and Thomas Edison. Today the property mainly serves as a museum and botanical garden. On weekends you'll often find a Florida destination wedding taking place. When planning a wedding many couples think of a beach destination wedding in Florida. Instead of a beach wedding, some choose to have their destination event at the former winter home of Edison & Ford. Location: Edison & Ford Winter Estates Fort Myers, Florida. 1/100; f/8.0; ISO 1000; 42.0 mm.